This is our Roman Chamomile Steam Distilled Essential Oil. Herbal Folk Traditional uses for Roman Chamomile include anorexia, dysmenorrhea, dyspepsia, flatulence due to mental stress, nausea and pregnancy vomiting. Roman Chamomile has been used as a liver tonic for thousands of years by people experiencing negative emotions such as anger, discontentment, melancholy, restlessness, short temper, tension and worry. It has a fresh, sweet, warm fruity and herbal scent. Roman Chamomile blends well with Angelica, Atlas Cedarwood, Bergamot, Blue Chamomile, Cistus, Clary Sage, Cypress, Eucalyptus, Fennel, Frankincense, Geranium, Grapefruit, Helichrysum, Jasmine, Juniper Berry, Labdanum, Lavender, Lemon, Mandarin, Marjoram, Melissa, Neroli, Nutmeg, Oakmoss, Orange (Sweet), Palmarosa, Patchouli, Rose, Rosemary, Sandalwood, Spikenard, Vetiver and Ylang Ylang. Roman Chamomile Essential Oil can be used as an antiseptic, antispasmodic, carminative and tonic. 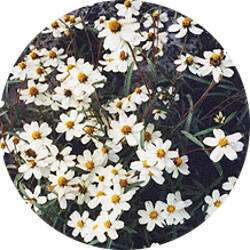 Roman Chamomile Essential Oil is also used in bath products, cosmetics, hair products, perfumes, soaps. Roman Chamomile Essential Oil has the following actions: analgesic, anti-anemic, anti-neuralgic, anti-phlogistic, antiseptic, antispasmodic, bactericidal, carminative, cholagogue, cicatrizant, digestive, emenagogue, febrifuge, hepatic, hypnotic, nervine, sedative, stomachic, sudorific, tonic, vermifuge and vulnerary.